Focus less on how much we eat and focus more on what we eat. 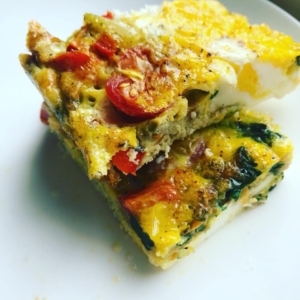 Here’s a deliciously healthy Homemade Frittata recipe from our very own nutritional therapist, Amy, that you can try for yourself! Preheat the oven to 180°C/350°F/gas 4 and grease a small baking tin with a little rapeseed oil. In a medium bowl, beat the eggs, sea salt and black pepper well, then set aside. Cut the bottom couple of centimetres off the asparagus, then slice into 2½cm long pieces. Meanwhile beat the eggs in a jug and add salt and pepper and slice the tomatoes in two. Once the veg has softened, add them to the baking tin along with the tomato, then pot the egg over the veg. Pop in the centre of the oven and cook for around 20-25 mins or until the eggs rise and turn golden. Head over to Amy’s Instagram to check out more of her delicious meals!